As Goode described the experience, I was attempting to recall any similar situation I may have had in my personal life, but, as expected, I don't have any quite as profound as this. 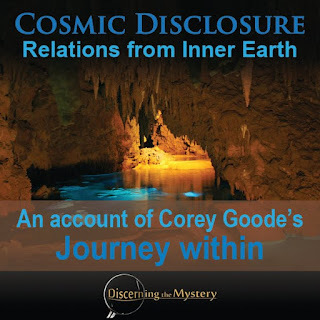 I have, however, had what you might call psychic interactions with a number of people around me with whom I have significant connections, but nothing quite like sharing memories, as Corey described here. In his account, Goode recalls childhood memories passed from mind to mind during this connection. Corey recalled how he witnessed the childhood of the priestess, and she was able to see and experience his childhood memories as well. I would think that any one of us would have been overwhelmed by such an monumental experience, and according to Goode, that was his exact reaction. This episode of Cosmic Disclosure gave a hopeful view of what we, as ascending humanity, have to look forward to with regard to new abilities, as well as new beings with whom we can connect in the near future. I look forward to next week to see what Corey and David have to offer. Click on the link below to watch this week's episode of Cosmic Disclosure.